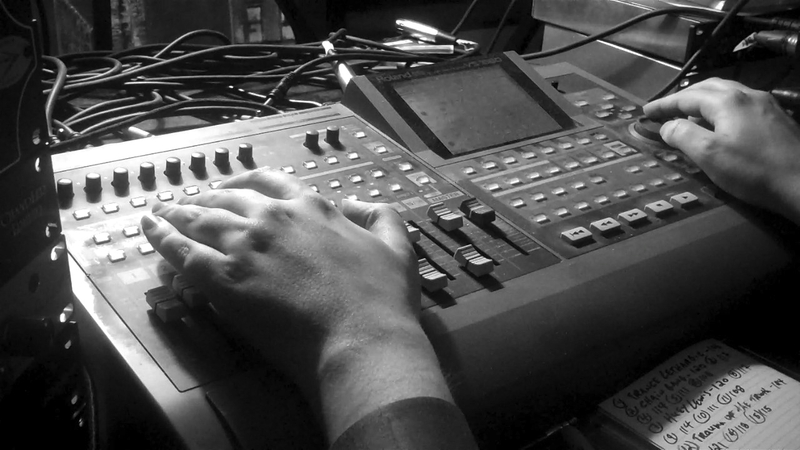 This Roland VS-1680 is still the “brain” of my recording setup after all these years. Everything around it has improved (and improved, and improved), but I’ve never seen any reason to retire the now hilariously obsolete mixer, and spending $10,000 or more on a Pro Tools or Avid system-with-interface would be difficult to justify even if I had a potted money plant hanging out in my closet. The mixer has served me well. Only once has it ever really crashed on me, and even then, all I lost was one replaceable bass part. But I never bothered to read the manual beyond the parts that were relevant to whatever I wanted to do when I was first getting used to working with the thing half my life ago. I know there are things it’s capable of that I still haven’t played with at all. I didn’t figure out that auto-punch-ins were a thing you could do until I was halfway through recording CREATIVE NIGHTMARES, and it was later still when I stumbled onto the ability to max out all sixteen tracks and bounce a mix down to two separate “hidden” tracks. Over the past few months, as some of the songs being recorded have had a lot of things going on inside of them and the amount of space they take up on the mixer’s hard drive has increased, having enough room to work on a lot of different things at any given time has become an issue. I got in the habit of backing things up on CD-R a long time ago, but backing up a few songs so you can erase them and make room for a few more, and then having to back those up to return to the ones you were working on before…it gets a little irritating and time-consuming after a while. I had a vague memory of reading something about the hard drive being split into two partitions, but I never did much investigating. Now seemed like a good time to look into it. Everything I read told me because of the nature of the drive, it had to be split into two parts in order to maximize its usefulness. I was reluctant to even take a look at this supposed other partition, afraid the mixer might suffer some sort of seizure and explode. I decided it was a chance I needed to take. So I pressed a few buttons, waited about ten seconds, and found a whole additional chunk of recording time I’d never touched. Virgin hard drive. It might have helped to educate myself about this fourteen years ago. Could have made things a lot easier when I was recording someone else’s music at the same time as my own, trying to juggle things and keep enough recording time available on the mixer for everyone. But maybe I found it at just the right time. Of course, within about a week that second partition was as maxed out as the first one. How else are you going to show it the ropes and make it feel at home?